This guide documents business operations with Red Hat 3scale 2-saas. Follow Accounts link from the Audience section on the Dashboard. As an admin, you can skip even some of the required fields. If you want to invite users to the account securely, you can also skip the password fields. However the email on this main admin account must be unique among all users. To search for specific accounts or filter all accounts that are in a “pending” (for approval) state, navigate to Audience > Accounts > Listing. To show only the pending accounts, select "Pending" in the dropdown list State and click Search. You can make individual approvals directly on each row, or select several rows at a time and perform a bulk approval. 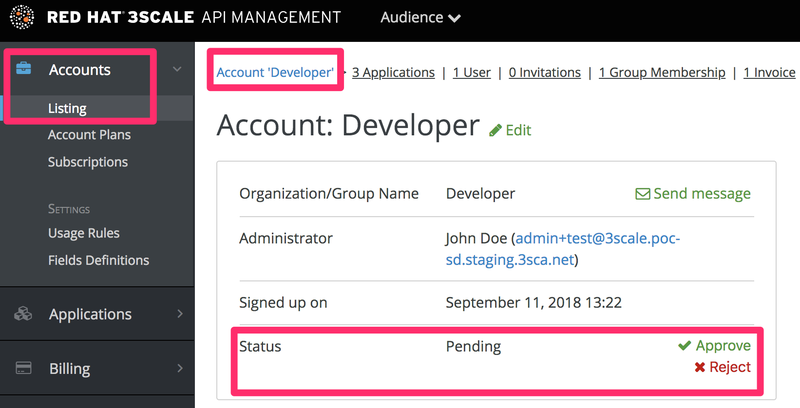 To search for specific subscriptions to a service or filter all subscriptions that are in a “pending” (for approval) state, navigate to Audience > Accounts > Subscriptions. To view Subscriptions, enable Service Plans in Audience > Accounts > Usage Rules. You can select one subscription or several at a time and perform a bulk approval. Navigate to Audience > Applications > Listing. Select "pending" in the dropdown list State and click Search. You can select one application or several at a time and perform a bulk approval. To search or filter specific accounts, navigate to Audience > Accounts > Listing. You can select one or more rows at a time, and change the plans. 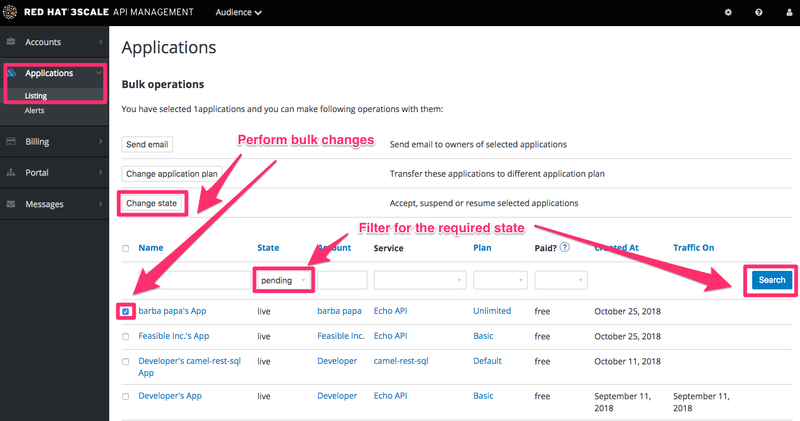 To search or filter specific subscriptions to a service, navigate to Audience > Accounts > Subscriptions. You can only view subscriptions if you have enabled Service Plans in the Settings page. You can select one or several subscriptions at a time, and change the plans. 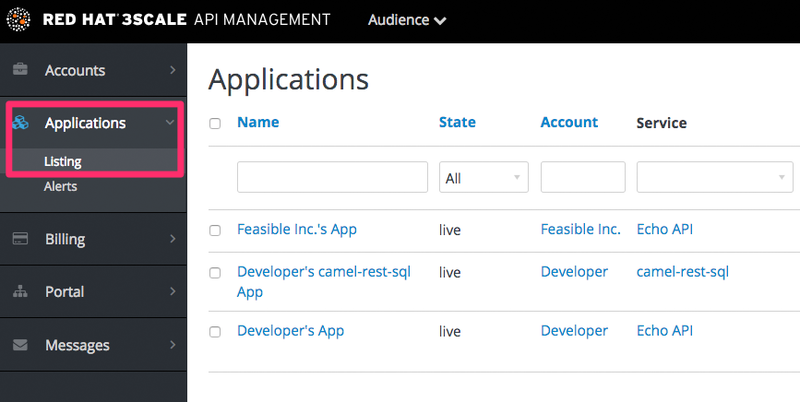 To search or filter specific applications, navigate to Audience > Applications > Listing. You can select one or several applications at a time, and change plans. If you already know the account and developer who manages the application in question, navigate to their account from the Accounts page in Audience > Accounts > Listing, as shown below. 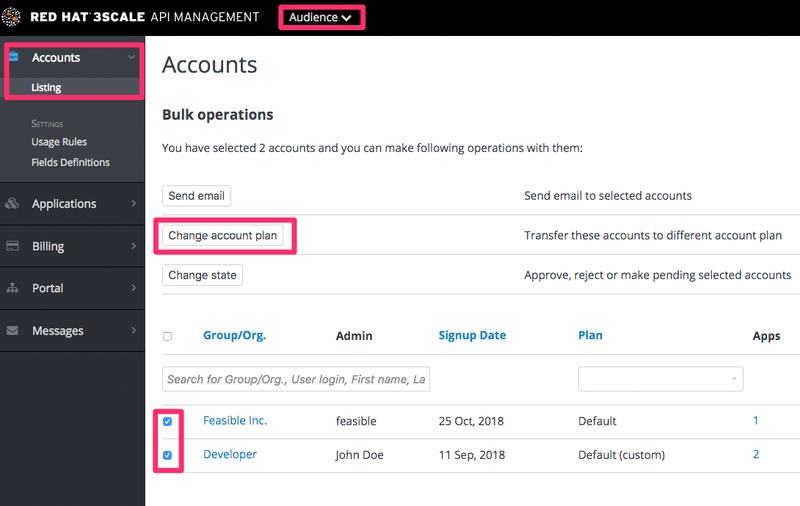 If you only have the application ID or API key, you can use the search box on the Accounts page in Audience > Accounts > Listing to find the relevant account. More information on locating applications is available here. Once you are in the account profile page as shown below, click the message icon. By default, the checkbox toggle is set to enabled. To do so, navigate to Audience > Accounts > Settings > Usage Rules. To find an application, you need the name of the account it belongs to or the application’s name. If you do not have this information, you can verify the access logs. To perform the search, navigate to Applications (Audience > Applications > Listing). 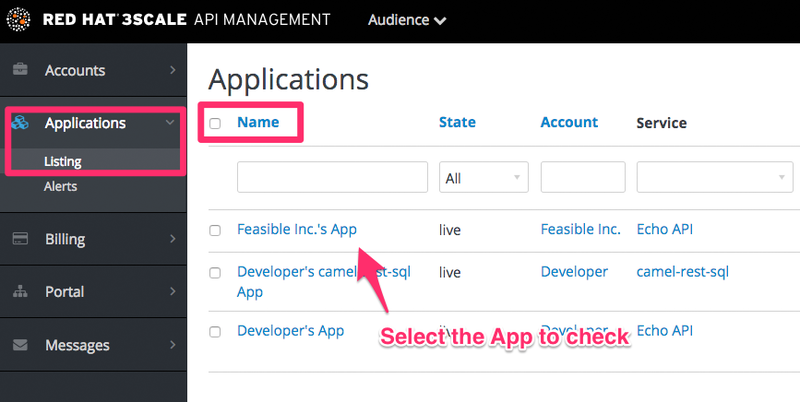 To search a given application, navigate to Applications page (Audience > Applications > Listing), and use the search box as shown in the image below. Navigate to Audience > Accounts > Listing. Choose the account in question. Select "Invitations" and then click Invite user. 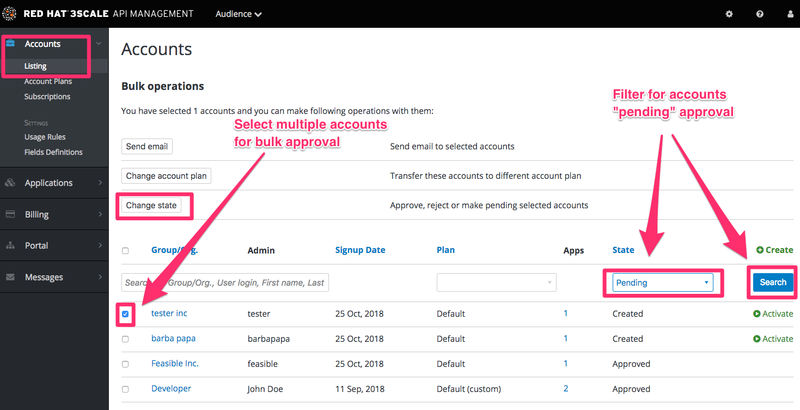 In the Admin Portal, navigate to Audience > Accounts > Listing > [select an account] > Service Subscriptions. Select Unsubscribe for the service that you want to remove the developer from. 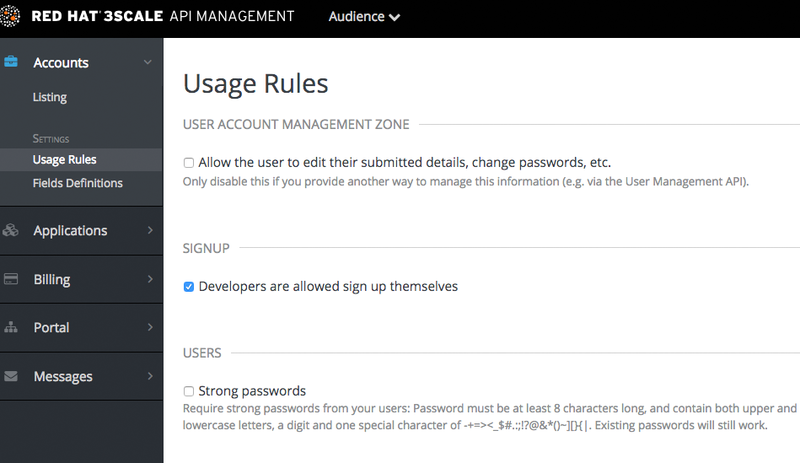 In the Admin Portal, navigate to: Audience > Accounts > Subscriptions. Using the service dropdown menu, identify the service from which you want to unsubscribe developers. Using the checkboxes on the left, select the developers you want to unsubscribe. Select Change State > Suspend to suspend the selected developer subscriptions. Remember that service plans need to be enabled. 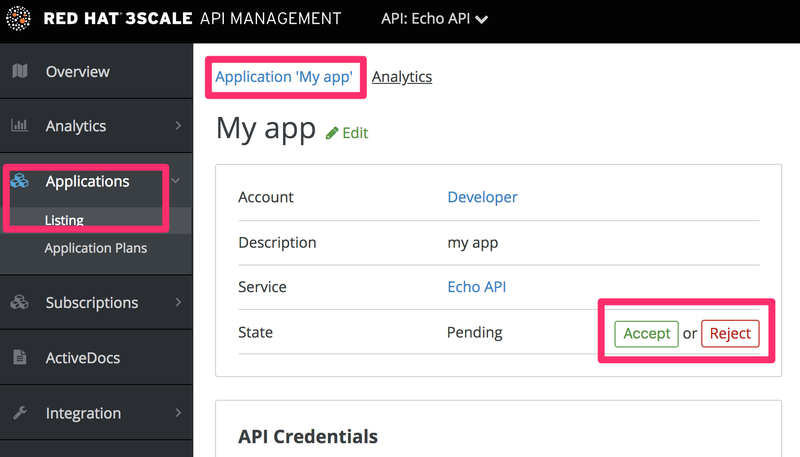 Once you have located the application and see the application summary page, click on the suspend icon next to the ‘State’ value. This action will immediately disable the application from the API and suspend all keys from working. Calls with these application keys will be rejected by the control system. 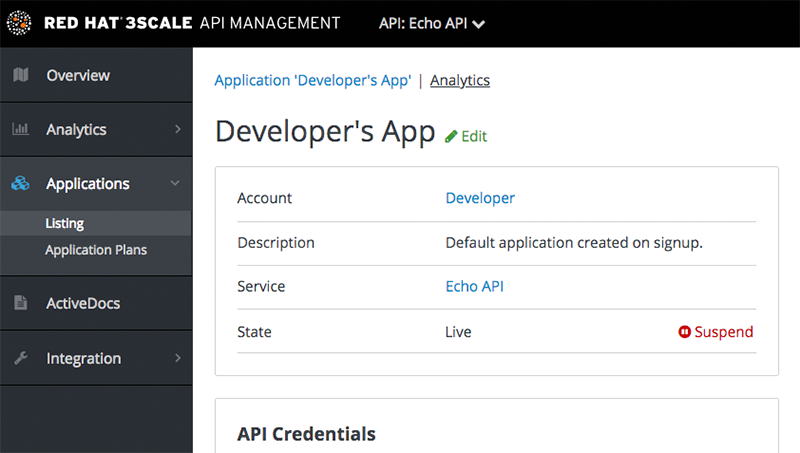 How you contact the developer of the application will depend on your workflow and policy. 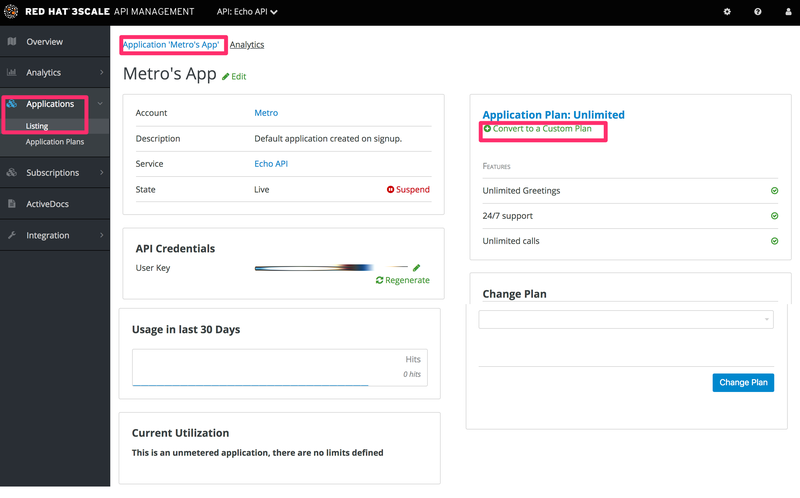 On the same page, you can click on the account name, which will take you to the account view where you can identify the key administrator of the account that owns the application. You can contact them either by email or by clicking on the send message button as shown, which will generate a dashboard message for the user. By the end of this section, you’ll be able to configure and take action on the webhooks in Developer Portal. A webhook is a custom HTTP callback triggered by an event. 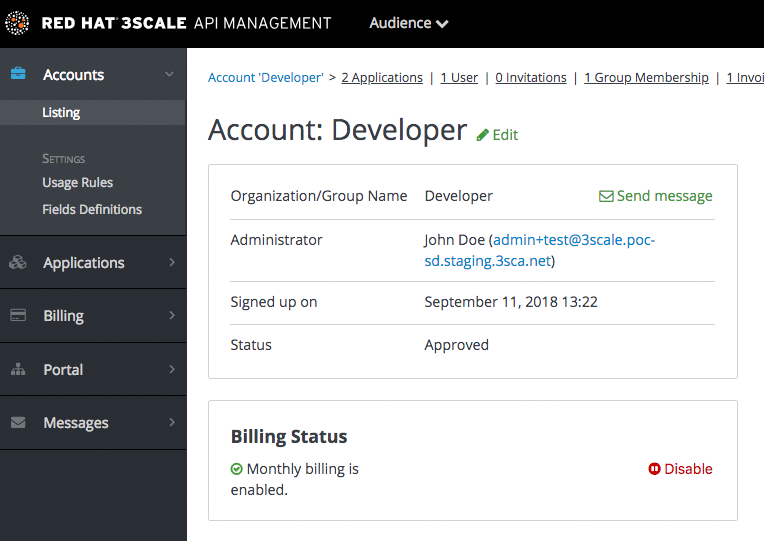 In the 3scale system, all the possible events are displayed in Account Settings (gear icon in the top right corner) > Integrate > Webhooks. The <type> gives you the subject of the event such as "application", "account", etc. The <action> – what has been done such as "updated", "created", "deleted". Finally the <object> is the XML object itself in the same format that is returned by the Account Management API. To check this, you can use our interactive ActiveDocs, available in your Admin Portal, under the question mark (?) icon located in top right corner, and 3scale API Docs.